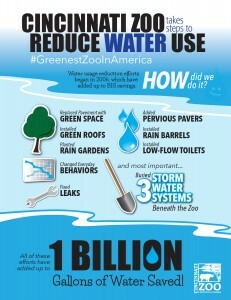 Zoo Saves One Billion Gallons of Water! Update: Since December 2018, the Cincinnati Zoo has saved 1.65 Billion gallons of potable water, many millions of gallons of sewage overflow diverted from the Ohio River and our neighbor’s basements, and 11.5 Million dollars in costs avoided. CINCINNATI (April 22, 2015) – The Cincinnati Zoo & Botanical Garden has saved one BILLION gallons of water, enough to provide water (indoor and outdoor use) for 10,000 households for a year, since 2006 when it launched a major initiative to reduce water usage! “We recognize the importance of conserving water and natural resources. It was obvious that the Zoo needed to take action when our annual water consumption reached a staggering 220 million gallons in 2005. As a responsible steward of the environment and a non-profit business striving to spend dollars wisely, that number was unacceptable,” said Mark Fisher, Cincinnati Zoo’s Vice President of Facilities & Sustainability. By aggressively fixing leaks in exhibit pools, installing low-flow faucets and fixtures, upgrading filtration systems and changing everyday behaviors, the Zoo brought the 2005 figure of 220 million gallons, enough water to fill around 335 Olympic sized swimming pools, down to 74 million gallons by the end of 2012 and used even less, 52 million, last year. This reduction in water waste and consumption has saved the Zoo 5.5 million dollars on its water bills; money that’s being reinvested in the Zoo’s infrastructure. Pervious Pavement: Pervious pavement allows rainwater to seep through it, instead of forcing water off the edges into sewer systems. Green Space – Acres of green space have replaced paved areas. Green Roofs: Instead of covering a roof with shingles, top it with living plants! Growing a green roof reduces storm water runoff, retaining up to 75 percent of rainwater instead of allowing it to drain through the sewers. The plants on a green roof filter out pollutants, take in carbon dioxide and release oxygen. Rain Gardens: In a rain garden, water thirsty plants are grown in a low spot designed to temporarily collect rainwater from downspouts and pavement. Up to 400,000 gallons of filtered rainwater sits below the Zoo in specially-designed storm water systems. This water is used to irrigate the Zoo’s botanical garden, clean animal enclosures, provide exhibit boundaries and fills pools for polar bears, sea lions, penguins and other animals. Water for the polar bear exhibit is chilled, cleaned and recirculated before being pumped into the exhibit. The largest storm water tanks were installed under the Zoo’s Africa exhibit when it was built two years ago and provide all the water used in the exhibit. The waterfalls, moats and streams that flow through Painted Dog Valley, the lion and cheetah exhibits and, eventually, the hippo pool are 100% reused rainwater. Cincinnati’s sewer system, a combined sewer overflow (CSO), is the oldest in the country. Due to the age and capacity of the system, heavy rain events cause billions of gallons of raw sewage to surge into the Ohio River, one of the most polluted rivers in the country. Metropolitan Sewer District (MSD) fully funded the tanks under Africa in an effort to reduce storm water runoff. The tanks keep 15 million gallons of water out of the sewer system annually! 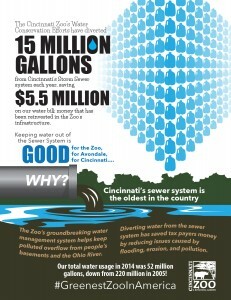 The Zoo’s groundbreaking water management system helps keep polluted overflow from people’s basements and the Ohio River. Diverting water from the sewer system has saved tax payers money by reducing issues caused by flooding, erosion and pollution. 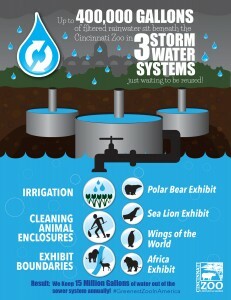 Eventually the Zoo hopes to get 100 percent of its property off of Cincinnati’s storm water grid. The Federal Environmental Protection Agency (EPA) is using the Zoo’s storm water management system as a model. The Africa exhibit is also on track to achieve a minimum Leadership in Energy & Environmental Design (LEED) Certified Gold. Water covers two-thirds of the Earth’s surface, but only a tiny percentage of it is available as clean, fresh water. The #GreenestZooInAmerica continues to seek new ways to use less of this precious natural resource. « Cincinnati Zoo Flies Away with a Plume Award!